Despite damming photographic evidence Judge Dredd has been cleared of two counts of murder. Presenting the head of a robotic replica directly to the Council of Five as proof he had been framed Dredd was acquitted by Chief Judge Goodman. Why and who perpetrated this incident is still unclear but speculation is rife that it was an inside job. Story: Bring Me the Head of Judge Dredd! Judge Dredd, recently convicted of the murder of two members of the press, has escaped and is at large here in the Big Meg. In a daring move Dredd hijacked shuttle 0949 that was transporting him to the Titan penal colony and crash landed back at Kennedy Spaceport. In an unprecedented move all of Mega City’s Judges have been re-tasked with finding Dredd. Why these three story aren’t folded into the main “Day the Law Died” storyline is a mystery. And the shift between two artists mid issue is not good. In a shocking event Lawman Joe Dredd – recently returned from Saving Mega City Two from the 2T(fru)T plague – murdered an editor and photographer at the Mega Times in an alleged row about his welcome home coverage. “Box” Paton clicked one last time snapping Dredd in a murderous rage. Tried by the Council of Five Judges with a unanimous vote Dredd was sentenced to 20 years on Titan, the penalty for all judges who lose their way in law. Despite testimony from Dredd’s house robot and Dredd claiming to have no recollection of the incident he was shipped off this morning. This is a sad day for Mega City One. 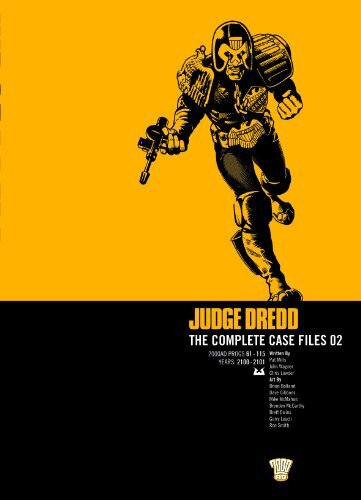 This is the longest Dredd story to date and one of the longest in Dredd’s history. Dredd must cross the whole of America, which has been turned into a radioactive wasteland called the Cursed Earth, to deliver lifesaving vaccine to Mega City Two. He can’t fly because the city’s spaceports are in the hands of infected cannibals. A flimsy premise that clearly stops him flying and landing outside the city. Or maybe hovering for a bit. One of the interesting points about this massive epic is that four issues are missing from the reprints. They have not been lost like Dr Who episodes but because they feature fast food brands copyright law prohibits them from being reprinted. Although presumably they were fine with being printed in the first place. This is a shame as having read them they present valuable social satire against the rise of the fast food culture that has its roots in the 1970’s and pervades our entire world today. The story doesn’t suffer their absence but they would be nice to see. You can find them online. The portmanteau style means sometimes we are following Dredd, sometimes we are listening to stories told by other characters and sometimes we are embedded in the consciousness of a dinosaur. This is a rambling and eclectic tale but with enough room to tackle, serious, emotional, light-hearted, action and adventure themes. Such a long story means a lot of switching between artists, notably Bolland and McMahon. These two styles are remarkably different but they are such regular contributors to Dredd that you don’t mind. The fragmented nature of the storyline also means when you change chapter you change artist making the transition much more acceptable. It is rough around the edges but solid gold at its core.